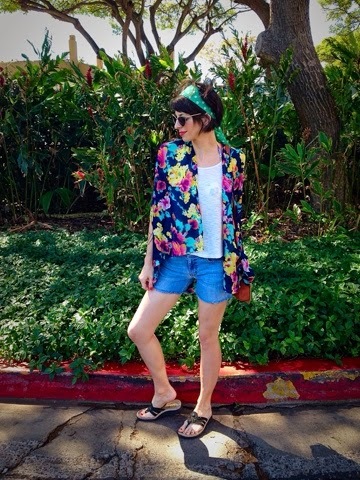 Getting ready for our big trip to Hawaii, I saw so many beautiful kimono style cardigans that I thought would be perfect to double as a swimsuit cover...but could not BELIEVE the high price tag! 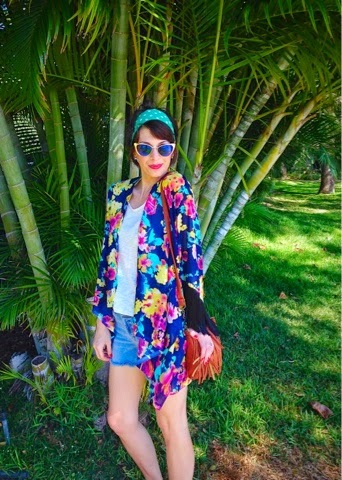 I love to take a couple new pieces with me on a vacation, especially something like this that can perform double duty as an outfit piece or as a swimsuit cover up. The fact that it can be rolled up in the suitcase and take up no space at all makes it even better. With our tight budget, I knew I couldn't swing one of the expensive ones, and decided to make my own, for less than $10. CHALLENGE ACCEPTED!! This pretty little frock took me all of 10 minutes to make!! (Maybe even less!) And I spent between $7 and $8 for material. 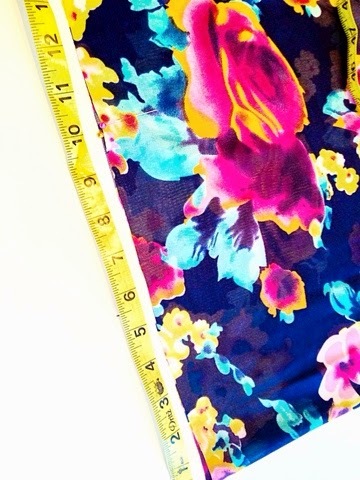 -Either a lightweight knit or sheer fabric (I used a printed chiffon type fabric) mine was 60"x44"
Also sure you have the appropriate needle for your type of fabric. 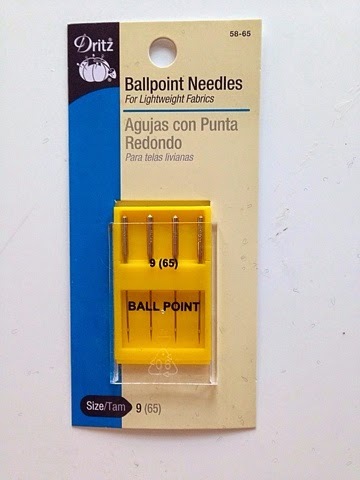 Trust me, this will make your life so much easier, and prevent the fabric or thread from bunching up. 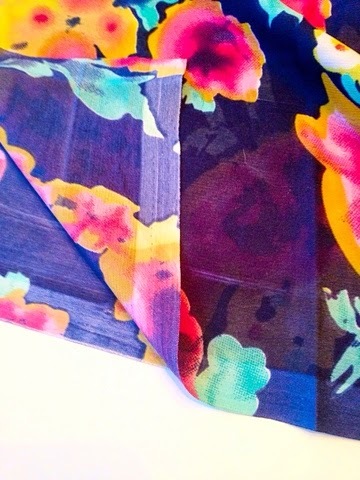 To begin, fold your fabric in half so the right sides of the print are facing out and insides are together. The folded length will be 30" and the width will be 22". Be sure the 30" fold is at the top and the 22" openings are on the sides. 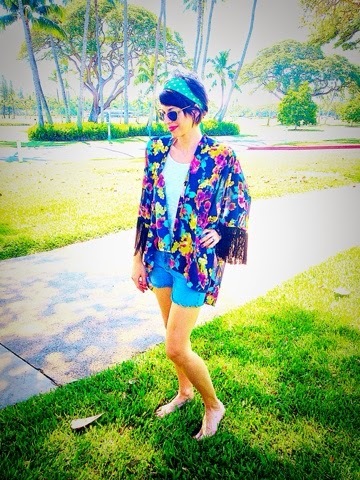 With your piece of fabric folded in half, take one piece of fringe and find the center. Pin the center point of the fringe to the inside of the top corner where the fabric folds. This will be one of your sleeves. 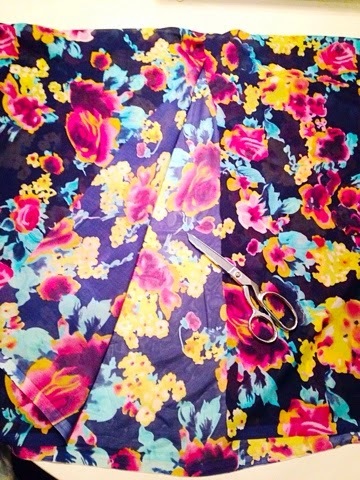 Be sure to pin along the inside of the fabric print with the fringe pointing in toward the center of your fabric. 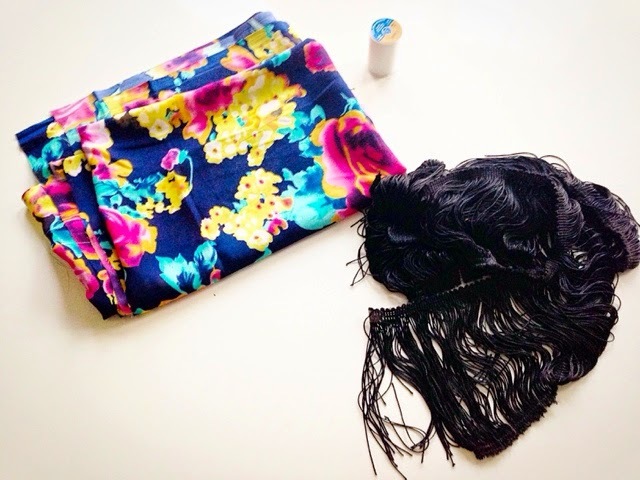 Pin the rest of that piece of fringe down along each side of the folded fabric. 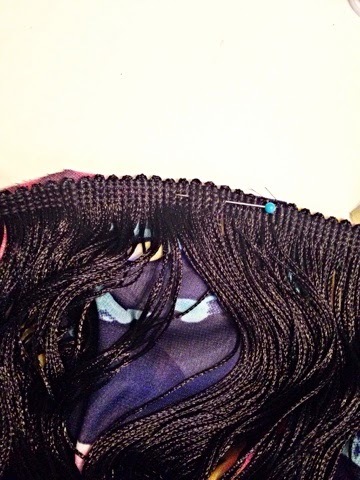 Repeat pinning the fringe on the opposite side. It should look like this on each side. The fringe has a nice finished edge so I placed it on the top of the sleeve instead of hemming the sleeve. Stitch fringe in place on each side. 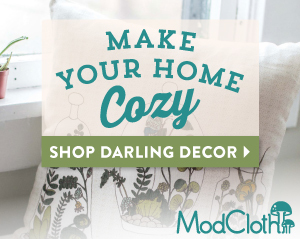 Now take your fabric and fold it inside out and lay it flat with right sides together. 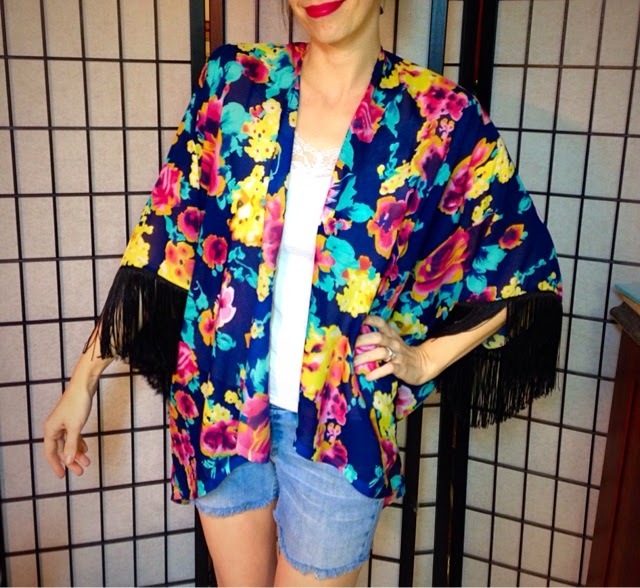 Each fringe piece should be facing inward toward itself with about 10" on each side. 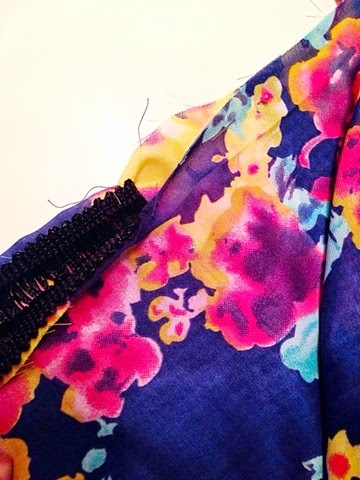 Just past where the fringe ends, begin to pin the fabric together along the edge. This will be about 10" down from your fold on each side with right sides of fabric print together. 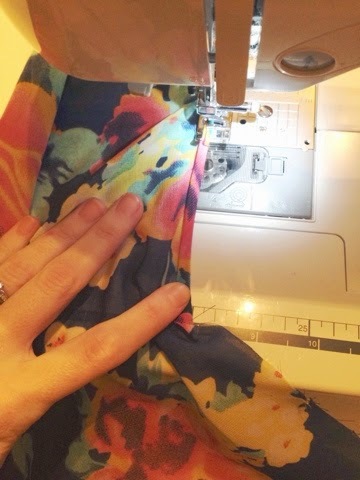 Sew a 1/4" seam where you have pinned just past the fringe and all the way down. 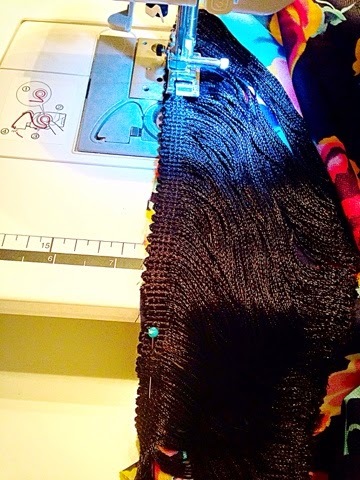 Arrow shows end of fringe, and where sewing begins, as shown by dots. Repeat on opposite side. 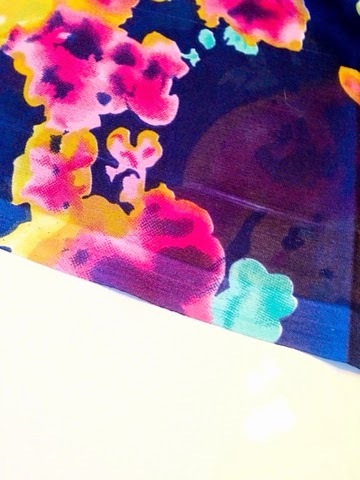 Turn fabric inside out and lay flat so the right side of fabric print is facing out. 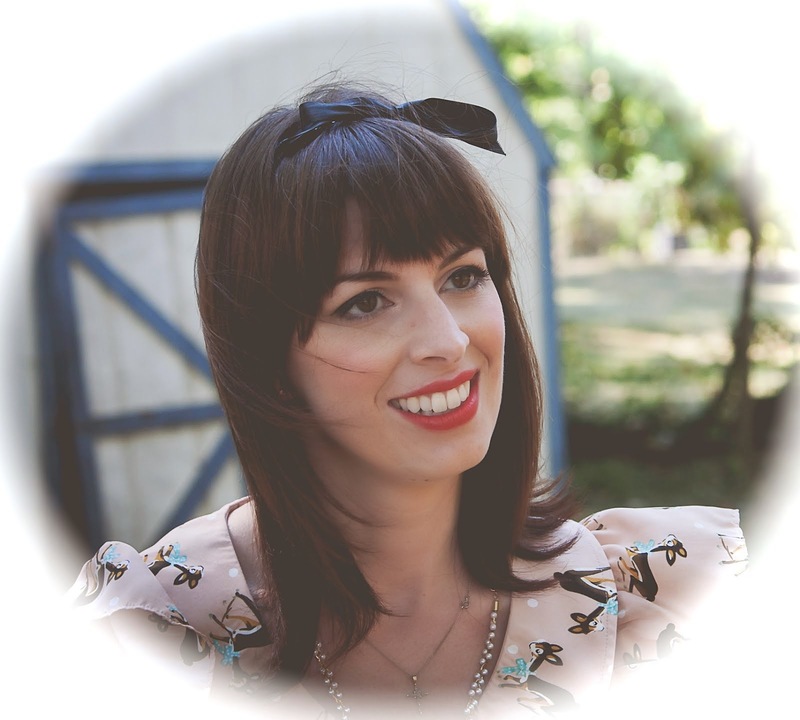 You should now have a fringe sleeve on each side, with the fold of your fabric at the top. 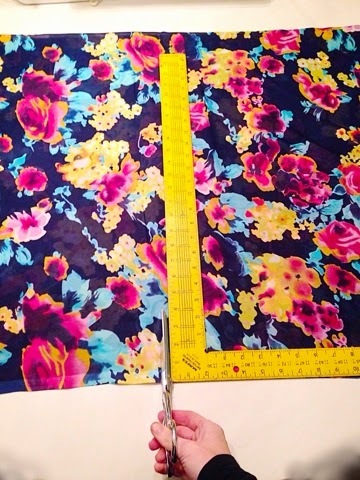 Measure to find the center of the fabric that is open at the bottom. Using a straight edge cut through the TOP LAYER ONLY until you are approximately 1/2" from the fold at the top. 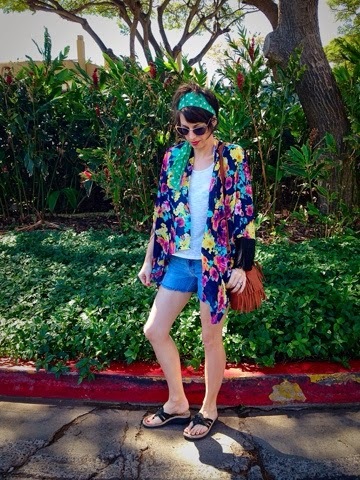 You know have the opening to your kimono cardigan. To create a nice finish on each side of the opening, I did a rolled hem. You can iron about an 1/8" under, and then another 1/8" under and pin. I found it easier with my material to roll it as I sewed. It will be a finished 1/8" hem on each opening. You can do this same type of hem to finish off the bottom. Or if you are lucky like me with a nice selvage edge on the bottom, you can just leave the bottom hemline alone. 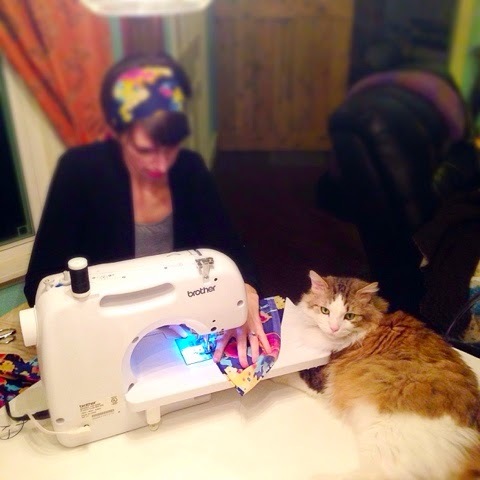 A nice helper, like my Benny Boo Boo here, helps to speed the process along. 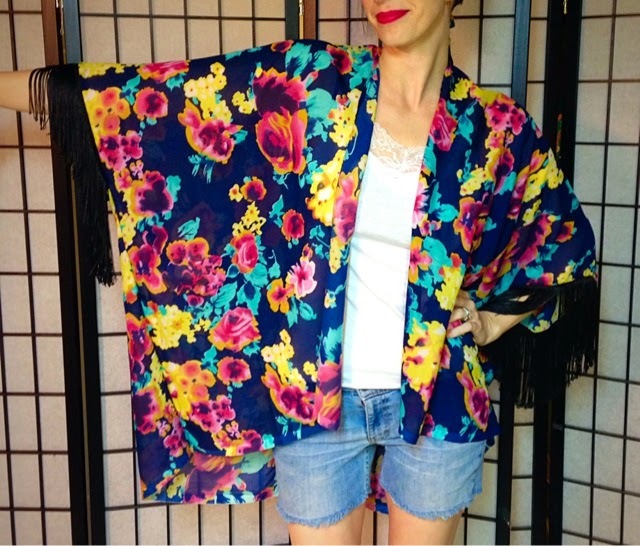 I love the finished look of this kimono. 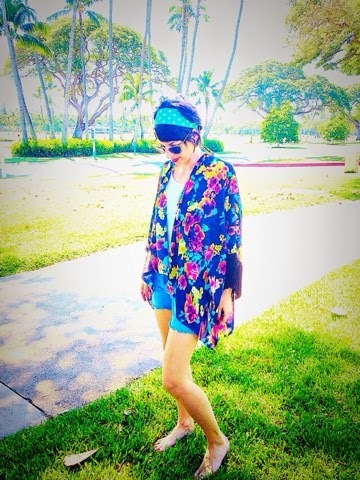 I wore it down to the beach almost everyday!! 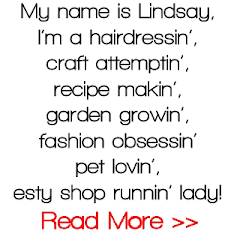 It is so versatile, it goes great with cut off jean shorts, or even jeans for a nice transition from winter into spring. This also looks really dressy over a mono-colored dress for an evening out. I hope you love this as much as I do! 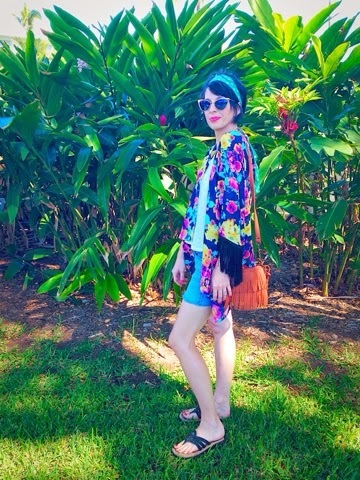 I felt so honored to get compliments on it on the beach in Maui! 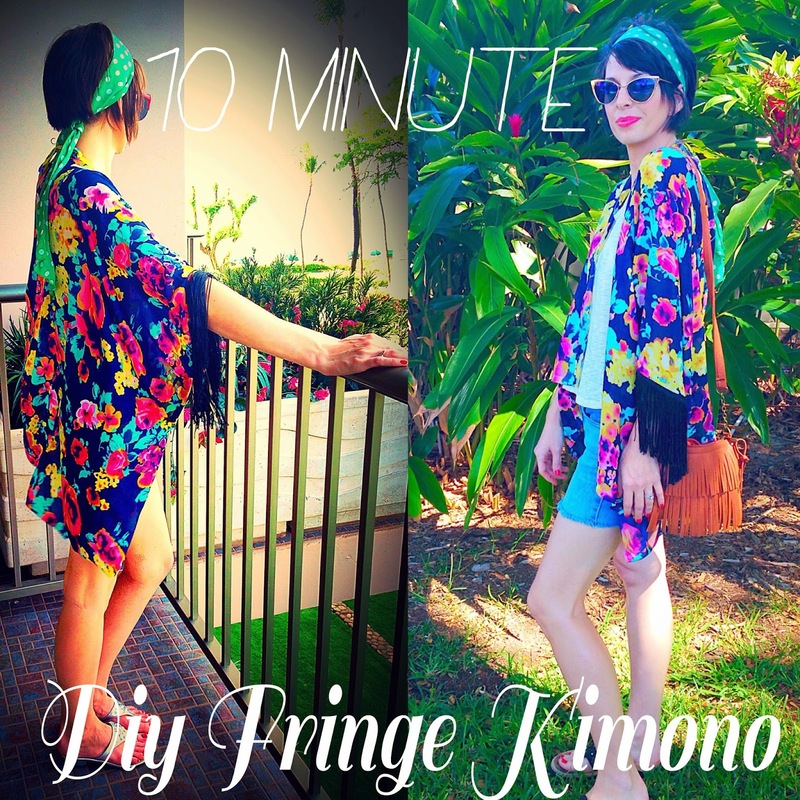 Please share your take on this 10 Minute Kimono in the comments below!! Mahalo!! Precioso, lo intentaré gracias por el tutorial.